The phenomenon of dual diagnosis describes a situation when a person is diagnosed with both a substance use disorder (such as alcohol use disorder) and a mental health disorder (such as depression, bipolar disorder, anxiety, etc.). An interplay between both conditions can complicate an individual's recovery—resulting in a less favorable treatment outlook and a compounded risk for negative health consequences without proper treatment. A dual diagnosis comes with a whole set of unique issues, and understanding these issues is key to treatment and recovery. Struggling with a psychological disorder and substance abuse is not an uncommon occurrence. In fact, more than 1 in 4 people experiencing a mental illness also suffer from a substance use problem. Those diagnosed with mood or anxiety disorders are nearly twice as likely to also suffer from substance use problems. 47% for people suffering from schizophrenia. 56% for those struggling with bipolar disorder. 78% for people seeking treatment for substance abuse problems. Of people hospitalized in a mental health treatment center in 2010, 6% were found to have a dual diagnosis with a non-alcohol substance use disorder, 4% with alcohol use disorder, and 4% with both alcohol and other drugs. With statistics such as these, it is clear that the dual diagnosis of mental health problems and substance abuse is an issue that mandates careful attention and treatment. 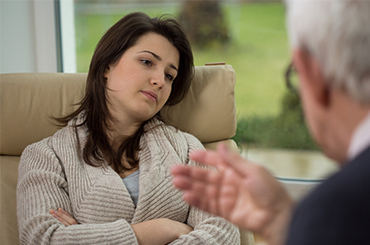 If you are suffering under the weight of a co-occurring disorder, you can ask for help. Call 1-888-993-3112Who Answers? to get connected with an inpatient treatment center. Be sure to ask whether they are qualified to treat dual-diagnoses. The effects of different substances tend to interact with particular mental health issues in semi-predictable ways. Often the effects of a particular abused substance serve to counter the symptoms of the corresponding psychological condition—for example, relaxing drugs are used more by people with anxiety-related disorders; “feel-good” drugs are used more by people with mood disorders (such as depression). Eating disorders (e.g., anorexia nervosa, bulimia nervosa). Schizophrenia and antisocial personality disorder have some of the highest rates of comorbidity with substance abuse. For example, 60-80% of people diagnosed with antisocial personality disorder were found to also be suffering from alcoholism, and 20-40% of people diagnosed with alcoholism were also diagnosed with antisocial personality disorder. People diagnosed with schizophrenia are more likely to use stimulants (such as nicotine, amphetamines, cocaine, and marijuana) though it is often unclear whether the mental disorder or the substance abuse arose first. Alcohol abuse is also associated with depression and anxiety. One study found that people diagnosed with alcohol use disorder were 4 times more likely to have depression and 3 times more likely to have an anxiety disorder. The mental disorder most strongly related to substance abuse is bipolar disorder, with some estimates putting the lifetime prevalence at 50-60%. This means that the probability of substance use and bipolar disorder occurring together is 50 to 60%. Substance use and abuse can elicit symptoms otherwise seen in the context of organic mental disorders. These symptoms are somewhat different than those of an independent mental disorder itself because they are a direct result of the substance use, and can typically be treated more quickly by discontinuing the substance. These symptoms may be related to a specific pattern of abuse, intoxication effects, as well as any withdrawal syndrome related to the substance. Severe anxiety as a result of discontinuing benzodiazepines. Depression as a result of stopping stimulants. Korsakoff's syndrome (memory and cognitive problems) due to chronic alcohol abuse. If a treatment facility is unfamiliar with the potential disorder-like symptoms of substance use, they may too hastily diagnose a person with comorbid substance abuse and psychological disorder. This can affect the treatment process, leading to improper individual treatment and misdiagnoses. Call 1-888-993-3112Who Answers? to find a treatment that suits your needs, and make sure to ask if staff are properly qualified to assess and treat dual-diagnoses and substance-induced disorders. Self-medication: A person with a mental disorder may be using the substances in a misguided attempt to self-medicate and treat their symptoms. For example, a person with depression may take drugs with euphoric effects, such as heroin. Increased exposure to drug use: Certain disorders may make a person more likely to be exposed to drugs and substance use. For example, conduct disorder in young people has been associated with later substance abuse. Lowered barriers to experimentation with drugs: A person with a mental disorder may be more inclined to experiment with different substances, particularly disorders that involve impulse control problems. Biological mechanisms: Substances may affect the chemical balance of the brain which, over time, can create, exacerbate, or uncover various mental disorders. For example, cocaine use may precipitate panic attacks and anxiety. Environmental effects: Substance abuse may expose a user to more stress and result in fewer sources of emotional support to cope with the increased stress—facilitating the potential development of a mental disorder. Genetics: Genes can create certain temperaments or dispositions that make one more (or less) likely to use drugs, or develop a mental health disorder that then facilitates the path towards drug use. Genes also affect the way a substance interacts with the brain and body. Personality: A propensity for risk-taking and novelty-seeking are personality traits that relate to substance abuse and other mental disorders. Brain chemistry: Dopamine is a brain chemical that is affected by both substance use and certain psychological disorders. Brain changes from one disorder may spur the development of the other. In addition, similar environmental triggers may underlie both disorders. High levels of stress, a history of trauma, and early exposure to drugs are all related to the development of dual diagnosis conditions. Each of these factors must be considered when evaluating an individual for a potential dual diagnosis. The health consequences of a dual diagnosis depend on both the substance being abused and the mental disorder present. Each disorder may compound the negative effects of the other, leading to exaggerated symptoms of both. Because a person with a dual diagnosis can experience more extreme and chronic symptoms, they may be more likely to neglect personal care. Both disorders have overlapping health consequences, and a dual diagnosis of both conditions indicates that a person is at increased risk for developing various diseases. Unfortunately, many people with either or both of these disorders have less access to adequate health care services, which may also explain why these negative health consequences persist in these populations. A person suffering from both substance abuse and mental health problems is likely to feel distressed by their disorders, leading to increased stress, feeling disconnected from friends or family members, lower self-esteem, and guilt. All of these effects can weigh heavily on an individual, leading to poor emotional health. Just as stress affects a person’s physical health, it affects their emotional health. People with comorbid disorders have an increased risk for depressed feelings, anxiety, and suicidal behavior. The particular mental disorder and specific substance being abused will also each have their own emotional effects. The summation of these emotional consequences can greatly impact treatment adherence. Dually diagnosed individuals are often at a greater risk for relapse. If you are suffering from a mental illness and have problems with substance abuse, you should consider seeking comprehensive treatment. Please call 1-888-993-3112Who Answers? and connect with a treatment program that suits your needs. A person diagnosed with substance abuse and another mental disorder can be particularly challenged by the social difficulties of a dual diagnosis. Because they are experiencing twice the problems of any disorder alone, relating to society and other people can be especially difficult. Some people may distance themselves from people close to them, reducing their support network without intending to. Friends and family members of a person struggling with a dual diagnosis may find it difficult to remain close to their loved one. Dual diagnoses are also associated with financial problems, employment problems, housing problems, and legal problems. Unfortunately, a dual diagnosis can give way to dual stigmas if it is not well understood, leading to poorer social support. Proper treatment must address the social struggles of a dual diagnosis as well as the disorders themselves. Once a professional makes an official diagnosis, treatment can begin. Patients struggling with both a substance abuse disorder and a mental health issue tend to have symptoms that are more persistent, extreme, and resistant to treatment than either disorder alone. Comorbid disorders tend to be more chronic than one disorder alone. Dual diagnoses have a more severe course of development. People with a dual diagnosis are often exposed to additional environmental risk factors. Medication options are limited because the potential for abuse is higher. These challenges can affect a dual diagnosis patient’s approach and response to treatment, making recovery more complicated. Adequate treatment will integrate both disorders in the recovery process, rather than have the patient work on each disorder separately. Addressing both disorders together recognizes that both have a powerful impact on the person’s life, and may even have positive synergistic effects when it comes to treating them. Treatment will often target common symptoms of the disorders, such as negative mood or impulse control problems. Treatment should also inspire incentives for change in order to keep dual diagnosis patients engaged. Because drugs provide instantaneous positive effects, it is important that treatment help the patient find their own alternative incentives and rewards for recovery. A dual diagnosis of substance abuse and another mental disorder brings with it many different challenges to the individual, their friends, and their family. The presence of a dual diagnosis may complicate the course of treatment somewhat but, with better understanding and education, this complex condition can be successfully recovered from. U.S. Department of Health and Human Services. Mental health and substance use disorders. National Institute on Drug Abuse (2010). Comorbidity: Addiction and other mental illnesses. Regier, D. A., Farmer, M. E., Rae, D. S., Locke, B. Z., Keith, S. J., Judd, L. L., & Goodwin, F. K. (1990). Comorbidity of mental disorders with alcohol and other drug abuse. Results from the Epidemiologic Catchment Area (ECA) Study. JAMA, 264, 2511–2518. Ross, H. E., Glaser, F. B., Germanson, T. (1988). The prevalence of psychiatric disorders in patients with alcohol and other drug problems. Archives of General Psychiatry, 45, 1023-1031. Ponizovsky, A. M., Rosca, P., Haklai, Z., & Goldberger, N. (2015). Trends in dual diagnosis of severe mental illness and substance use disorders, 1996-2010, Israel. Drug and Alcohol Dependence, 148, 203-208. Kessler, R. C. (2004). The epidemiology of dual diagnosis. Biological Psychiatry, 56, 730-737. Sheehan, M. F. (1993). Dual diagnosis. Psychiatric Quarterly, 64(2), 107-134. Schuckit, M. A. (1986). Genetic and clinical implications of alcoholism and affective disorder. American Journal of Psychiatry, 143, 140-147. Schuckit, M. A. (1983). Alcoholism and other psychiatric disorders. Hospital and Community Psychiatry, 34, 1022-1027. Schuckit, M. A. (1973). Alcoholism and sociopathy- diagnostic confusion. Quarterly Journal of the Studies on Alcohol, 34, 157-164. Hesselbrock, M. N., Meyer, R. E., & Keener, J. J. (1985). Psychopathology in hospitalized alcoholics. Archives of General Psychiatry, 42, 1050-1055. Cadoret, R., Troughton, E., & Widmer, R. (1984). Clinical differences between antisocial and primary alcoholics. Comprehensive Psychiatry, 25, 1-8. Powell, B. J., Penick, E. C., Othmer, E., et al. (1982). Prevalence of additional psychiatric syndromes among male alcoholics. Journal of Clinical Psychiatry, 43(10), 404-407. Burns, L. & Teesson, M. (2002). Alcohol use disorders comorbid with anxiety, depression and drug use disorders- Findings from the Australian National Survey of Mental Health and Well Being. Drug and Alcohol Dependence, 68, 299-307. Chambers, R. A., Krystal, J. H., & Self, D. W. (2001). A neurobiological basis for substance abuse comorbidity in schizophrenia. Biological Psychiatry, 50(2), 71-83. Substance Abuse and Mental Health Services Administration (2005). 9 substance-induced disorders. U.S. National Library of Medicine (2016). Alcohol withdrawal. National Institute of Mental Health (2016). Anxiety disorders. National Institute of Mental Health (2016). Attention deficit hyperactivity disorder. National Institute of Mental Health (2016). Depression. Maremmani, A. G., Rovai, L., Rugani, F., Bacciardi, S., et al. (2015). Journal of Affective Disorders, 179, 156-160. Costello, E. J., Mustillo, S., Erkanli, A., Keeler, G., & Angold, A. (2003). Prevalence and development of psychiatric disorders in childhood and adolescence. Archives of General Psychiatry, 60, 837– 844. Anthony, J. C., Tien, A. Y., & Petronis, K. R. (1989). Epidemiologic evidence on cocaine use and panic attacks. American Journal of Epidemiology, 129(3), 543-549. Dartmouth College. Dual diagnosis: mental illness and substance abuse. National Institute on Drug Abuse (2014). Drugs, brain, and behavior: the science of addiction. Hert, M. D., Correll, C. U., Bobes, J., Cetkovich-Bakmas, M., et al. (2011). Physical illness in patients with severe mental disorders. I. Prevalence, impact of medications and disparities in health care. World Psychiatry, 10(1), 52-77. Bartels, S. J., Drake, R. E., & McHugo, G. J. (1992). Alcohol abuse, depression, and suicidal behavior in schizophrenia. American Journal of Psychiatry, 149, 394−395. Drake, R. E., Mueser, K. T., Clark, R. E., & Wallach, M. A. (1996). The course, treatment, and outcome of substance disorder in persons with severe mental illness. American Journal of Orthopsychiatry, 66, 42−51. Chan, Y. F., Dennis, M. L., & Funk, R. R. (2008). Prevalence and comorbidity of major internalizing and externalizing problems among adolescents and adults presenting to substance abuse treatment. Journal of Substance Abuse Treatment, 34, 14−24. Xie, H., McHugo, G. J., Fox, M. B., & Drake, R. E. (2005). Substance abuse relapse in a ten- year prospective follow-up of clients with mental and substance use disorders. Psychiatric Services, 56, 1282–1287. Mueser, K. T., Drake, R. E., & Wallach, M. (1998). Dual diagnosis: A review of etiological theories. Addictive Behaviors, 23, 717−734. Salyers, M. P. & Mueser, K. T. (2001). Social functioning, psychopathology, and medication side effects in relation to substance use and abuse in schizophrenia. Schizophrenia Research, 48, 109−123. Hagnell, O. & Grasbeck, A. (1990). Comorbidity of anxiety and depression in the Lundby 25-year prospective study: The pattern of subsequent episodes. In: Maser, J. D., Cloninger, C. R., Eds. Comorbidity of Mood and Anxiety Disorders. Washington, DC: American Psychiatric Press, 139 –152. Murphy, J. M. (1990). Diagnostic comorbidity and symptom co-occurrence: The Stirling County Study. In: Maser, J. D., Cloninger, C. R., Eds. Comorbidity of Mood and Anxiety Disorders. Washington, DC: American Psychiatric Press, 153–176. Kessler, R. C. (1995). Epidemiology of psychiatric comorbidity. In: Tsuang, M. T., Tohen, M., Zahner, G. E. P., Eds. Textbook in Psychiatric Epidemiology. New York: John Wiley and Sons, Inc., 179 –197. Kranzler, H. R. & Rosenthal, R. N. (2003). Dual diagnosis: Alcoholism and co-morbid psychiatric disorders. American Journal on Addiction, 12(1), S26 –S40. Kavanagh, D. J. & Connolly, J. M. (2009). Interventions for co-occurring addictive and other mental disorders (AMDs). Addictive Behaviors, 34, 838-845.